It is time once again to cast your vote for the Briscoe Awards (2012). 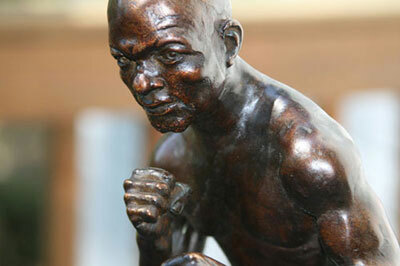 As usual two categories are up for grabs: "2012 Philly Fight of the Year" and "2012 Philly Fighter of the Year". The 6th Annual Briscoe Awards will be presented in October. When casting your vote, please remember that these nominations are for the 2012 Philly fight year (January 2012 thru December 2012). The careers of some of the nominees have had some major developments in 2013, but these developments should not affect your vote for the 2012 awards. You may vote for both awards via e-mail by following the "VOTE" link at the bottom of the page, or by visiting BriscoeAwards.com. and finished the year with a highlight-reel KO of Erik Morales in a rematch. made a bid for ring stardom with his three high-profile victories. everyone take notice. It was one of the best career-years in recent memory. in a very good year of boxing. You may vote for your selections by clicking the link at the bottom of the page and sending us an e-mail. You can vote for both categories (Fighter & Fight) in the same e-mail. Once the final selections have been made, the winners will be announced on this web site, as well as Facebook and Twitter. TEVIN FARMER W6 TIM WITHERSPOON JR.
and the IBS lightweight title belt. THE FIGHT (as described by PhillyBoxingHistory.com): "...The fight of the night was the six-rounder between Tim Witherspoon Jr. and Tevin Farmer, both of Philadelphia. They vied for something called the IBS National Title. IBS Stands for Independent Boxing Syndicate. The title opportunity was obviously arranged to benefit Witherspoon, the son of the former two-time heavyweight champ. But the powers that be obviously didn't know what Tevin Farmer could do. From the opening bell, southpaw Farmer aggressively worked Witherspoon. He won the opening two rounds fairly easily, but the action was two way. Witherspoon began to use his jab effectively in the third, and began to control things a bit better. Still Farmer made the fight with his non-stop forward-moving style. The fourth round was a barnburner with both fighters swinging and landing freely. Witherspoon had the edge and evened the bout (two rounds each) by taking the round. Farmer worked hard in the fifth and sixth rounds. He threw flurry after flurry, and was aggressive and busy. The fight was close and well matched. 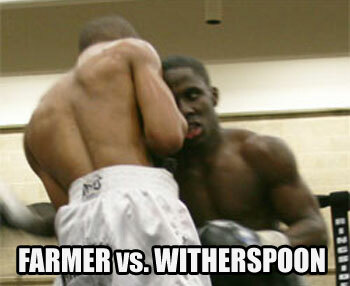 Every round was full of action with Witherspoon fighting slicker, but Farmer landing harder. The crowd loved every minute of it." NBC Sports Network Fight Night series. The fight was close, with the heavier Byarm landing more consistently early on. 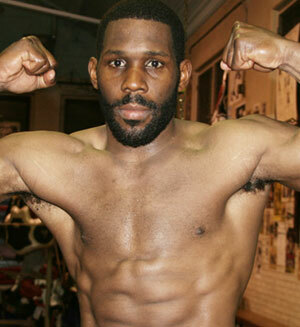 But Jennings fought in explosive spurts that showed he was the "bigger" guy. 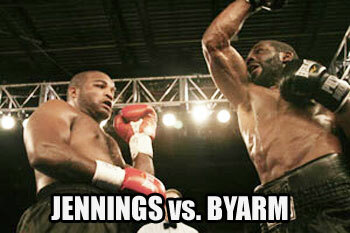 Jennings responded to Byarm's offense with sharper and faster punches of his own, and despite the lower KO percentage between the two, Jennings seemed to have the heavier hands. The fight was more or less even after six rounds. As they entered the new territory of the post 6th-world, you'd never know either man had yet to experience it. Both fought through any nerves or fatigue, and continued to throw punches at the other. They clinched and caught their breath, but not nearly as much as you might think they would. These guys were hungry and both wanted to win badly. Down the stretch of the fight, the pattern remained set. The action teetered between the two with Jennings having a slight edge in work rate and power. But his bursts of activity made more of an impression. Once the final bell had rung, the decision seemed to be a toss up. 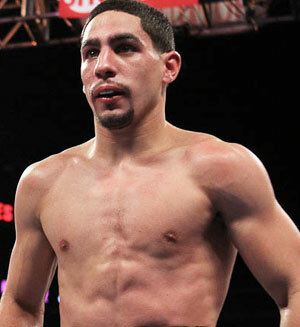 The crowd loved the fight and the steady action that it provided." also the USBC lightweight title belt. THE FIGHT (as described by PhillyBoxingHistory.com): "...Lightweights Angel Ocasio and Jason Sosa lit up the National Guard Armory Friday night by waging an all-out war of a rematch. The pair fought to a six round draw in their first meeting in January. This time, they picked up right where they left off three months ago and made fight number two a gritty, high-energy battle that had the Armory crowd roaring with approval. After eight solid rounds of close, give and take action, the three official judges once again could not pick a winner, and called the fight a draw. After the fight, of course all the attention was focused on the scoring. Although that is understandable, let's not forget the quality of the fight put up by both men. They fought hard for eight rounds, and never took a breather. Everyone watching was treated to one of the best Philly fights of the year. Opinion on the decision was split around ringside as well. A quick poll of the other boxing writers, produced varied judgment. 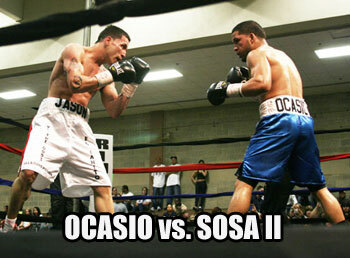 Some felt Sosa had won, some favored Ocasio, and many had it even. So maybe the official judges got it right." Classic crossroads fight with Hunter's career viability against Belmontes' undefeated record, all playing out on national TV. Belmontes came to Philly as a highly touted 17-0 prospect, the betting favorite to extend his undefeated streak, and the fighter who could finally send Hunter away for good. But Eric Hunter, brushed off the chip he always carries on his shoulder, ignored the distrust he has of the world outside the boxing gym, and chose this night to stage his coming out party. His timing couldn't have been better. 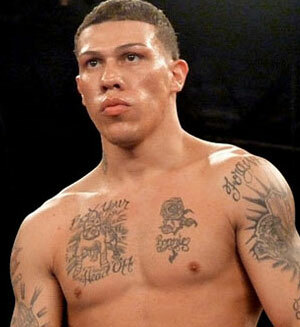 With a rowdy North Philly crowd and a wide audience watching at home, Hunter took Belmontes to school in the ring. Despite a deep amateur resume of his own, the "Corpus Christi Kid" could not match skills with the West Philadelphian. Hunter sent his message early on, landing a few good hard shots to his opponent's head and working the body well. Belmontes jabbed, but failed to land with significance, while Hunter attacked with his foot on the gas. More effective body work and a hard right hand found the mark as the first round ended. 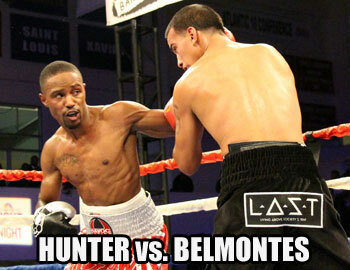 In the second round, Hunter continued to rake Belmontes' body with solid shots. Then as Belmontes opened up and tried a combination, Hunter let loose with a short counter left hook that knocked Belmontes to the floor. The knockdown shocked Belmontes, who rose to his feet wide-eyed, but that expression would change to one of frustration as the fight wore on. Belmontes had moments in the fight, especially in rounds three and four, when he landed hard shots that snapped Hunter's head back. But this night was Hunter's. He embraced the moment, filtered his paranoia, and let his talent shine..."
You may vote for your selections by clicking the link below and sending us an e-mail. You can vote for both categories (Fighter & Fight) in the same e-mail. Once the final selections have been made, the winners will be announced on this web site, as well as Facebook and Twitter.